when supply is most plentiful and to sell when demand is most aggressive. Markets move in impulses or waves. No move, either up or down, is uninterrupted. 2) TD Countdown, which is trendbasedand compares the close with thehigh or low two periods earlier. Price Flip. This means the close prior to setup close No. 1 must be greater than or equal to the close four price bars earlier; only then can the buy Setup process begin. (Note: For cash currency markets, use the New York close, which is 10 p.m. London time, asthe end of the trading day.) Once a minimum of nine consecutive closes less than the corresponding closes four price bars earlier are fulfilled, these bars are numbered 1 through 9. If that series is interrupted at any time prior to completion, the count is erased and the process must begin anew. series is interrupted at any time prior to completion, the bar numbers are erased and the process must start again. 7. Until that occurs, the anticipated price reaction is less probable. There are two events that cancel a buy Countdown prior to completion:the application of TD Sequential to cash currency trading. Setup series (green numbers) that completed in late May 2004; the red arrow above the “9” indicates the sell Setup was “perfected.” Notice the upside progress was interrupted for 11 trading days after this bar, as price moved sideways and then declined. The Countdown process then began, with the qualifying bars labeled with red numbers. The peak of the rally was marked by a Countdown “13” and exhausted the upside for this market. Notice another sell Setup developed simultaneously with this Countdown (the second series of green numbers, below the red Countdown numbers). This sell Setup was not perfected until the high close (day 12 of the Countdown) because days 8 and 9 of the sell Setup were below Setup day 7, and the high of Setup day 7 was not exceeded until two days after the sell Setup day 9, which happened to be the Countdown “12” day, and the highest close of the rally. 13 bar occurred, however, downside pressure subsided and the market rallied. reversals, price tested the 13 price level in each instance and then recorded secondary Setup 9 series. Both Setup 9 series were perfected, which served to reinforce the original 13’s. Also, the Setup 9/Countdown 13/Setup 9 series that completed at the late-July bottom was particularly interesting because it defied conventional technical wisdom, which at that point interpreted the trend as bearish on the daily, weekly and monthly time frames. In October, another perfected Setup 9 appeared that stalled the uptrend for a few days, after which the market entered the Countdown process. In Figure 3 of the Australian dollar/ New Zealand dollar cross rate (AUD/NZD), four of the five Setup series have arrows that coincide with either a short-term price reversal or price consolidation. The two Countdown 13 bottoms had immediate upside price responses that proved tobe profitable moves. Forecasting trends instead of following them The advantage of using TD Sequential instead of conventional trend-following methods is that you can buy into weakness and sell into strength (and do so in size). When following trends, entry competition produces slippage and price gaps that cut into performance. Operating against the trend is often difficult because it contradicts human nature. However, these examples showthere are distinct advantages to doing so, and TD Sequential is an indicator designed specifically to accomplish this goal. (note:Doda stochastic indicator is better than standard stochastic indicator). When TDSequential count nine and after it count one in opposite direction, look doda stochastic indicator and wait that it crosses upward. When TDSequential count nine and after count one in opposite direction, look doda stochastic indicator and wait that it crosses downward. When Doda stocastic indicator crosses in opposite direction. 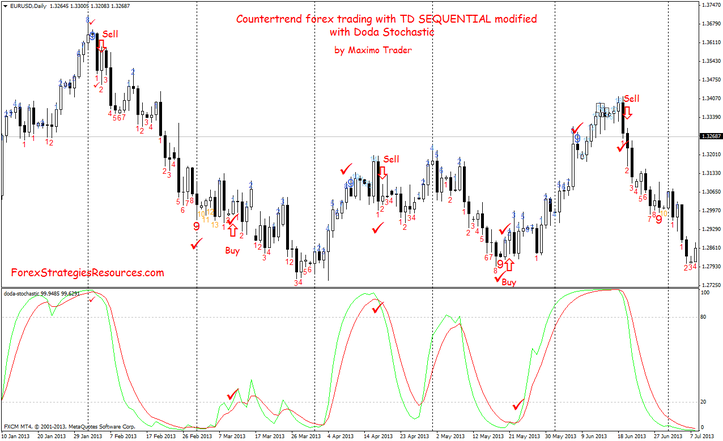 TD Sequential with Doda Stochastic Template and indicators.